Our mama-fave, The Tummy Rub Butter has been SUPERSIZED. Get the ultimate protection, for less. I was told about the Tummy Rub by a fellow mum-to-be and I've never looked back. it smells fresh, leaves your skin feeling smooth and protected and is a good quality cream. It says say no to stretchmarks and so far, so good - not a stretchmark in sight. Good quality and well worth the money! I used this from about 24 weeks twice a day and didn’t have a single stretch mark! Would recommend! I’ve been using the tummy rub butter since around 25 weeks which is when my bump started to grow, I am now 37 weeks and still growing with no stretch marks! (Fingers crossed) I honestly thought I would be prone to have them as I have stretch marks on my sides and thighs from teenage weight gain and loss! I used the butter as recommended by a friend who also didn’t have any stretch marks from using the butter. It’s doing the job so far, and would also say it smells beautiful and is a really nice to spend time morning and evening massaging into bump, my husband also rubs it in for me before bed which gives him a nice bonding time as he isn’t 100% confident talking to bump haha! I ordered the tummy rub butter along with the oil. The butter goes on nice at first but then it dries really crispy and makes my skin look like it’s peeling. It doesn’t seem to sink into the skin and just sits on top so I’m sure it’s not very effective. I bought the supersize and it was a complete waste of money because I can’t use it. I would recommend trying a tester before purchasing this product. The only reason I don't give 5 stars is that the 240g pot is rarely available and the smaller ones are way too expensive!! - I'm hoping that it will come back into stock soon so that I can continue using it. That aside - I can not fault the rub. I am 39 and did not get a single stretch mark after giving birth a few weeks ago. Some people say this is just a genetic thing but I do have previous stretch marks from puberty suggesting it is down to the rub - not the genes! The rub smells nice, is easy to apply and soaks in fast so you feel you can get dressed straight after. I even used it on my arms and legs. It really is a great product and hopefully I'll be able to continue using it as my regular moisturiser. Amazed with the product, texture easy to apply, nice smell, ice feeling in my skin which is left moisturised and no oily. Definitely a recommended one for future mums to preserve and feed the skin to avoid stretch marks. Started using this cream more than a month ago and I am really happy with it. it is not sticky at all and leaves my dry skin very smooth and nice. I am not sure if it works for marks and stretches, I don't have any so far...and I really hope it stays like this. :) would buy again and definitely recommend! I can’t comment on whether the cream works or not for stretch marks yet (I’m only 9 weeks), but I can say that it’s a lovely thick, very moisturising and beautifully fragranced cream!! I’m only using it once a day at the moment, but it’s a pleasure to massage in. I’ll be continuing with this and will also check out some of the other products in the range. I have been using this for a month, prior to that I was using rosehip, vitamin E and coconut oils. This along with the mamamio oil. It feels very moisturising and smells nice. I am developing stretch marks despite using this product, and the marks have actually increased in the last month and they were minimal prior. I cannot say for certain if I continued to use the previous products if this would have happened. I only used the product once. The smell is so so strong, it made my nauasea worse. I dont know if the product works, but I hope they make one with a mild scent. This cream smells amazing and feels so soft on my skin. It's really creamy and drys right away so can apply then get dressed right away without having to wait. I love it. I used mama mio tummy rub and oil throughout last pregnancy morning and night and was stretch mark free at end of pregnancy! I'm now pregnant with second and 31 weeks in have been using mana mio since the start. No stretch marks so far and skin looks great! It is a little pricey but I think is so worth it! I have some light stretch marks on thighs from teenage years so I'm definitely prone to them!! Love this product! I have used the Tummy Rub butter and oil together throughout all of my pregnancies. At 5 ft 1" with one of the biggest bumps you'be ever seen, (plus my mum also got stretch marks), it's a miracle I didn't get any. I couldn't recommend it more highly, and love the fact it's all natural. The smell is great too. I'm now using it post pregnancy to help my belly shrink back down and it's also working marvellously for that. 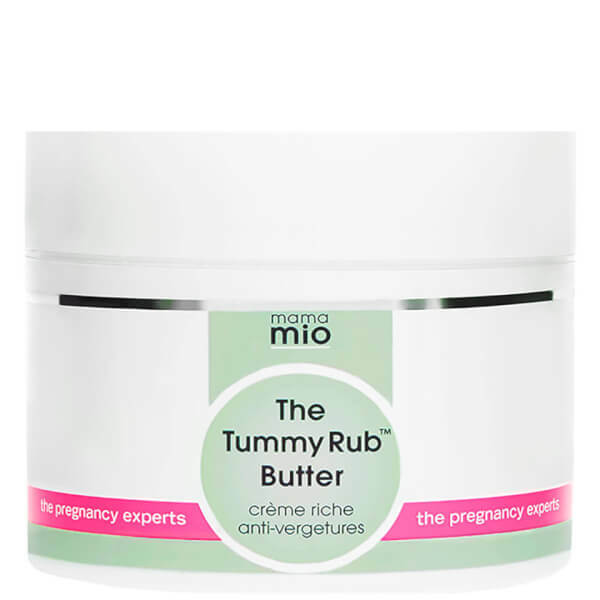 I used Mama Mio tummy rub with both my pregnancies and I have no stretch marks in sight. It feels and smells absolutely fantastic . I would recommend it to anyone without hesitation . Worth every penny. I used the tummy rub butter and oil throughout my first pregnancy and loved them and the results. So when i found out i was pregnant for the second time I was thrilled to see you now have it in supersize! I'm now in my last 2 weeks of my 2nd pregnancy and not a stretch mark in sight! Keep up the good work!